We are engaged in offering a wide range of Fumigation Chamber to our valuable customers. Versatile fumigation chamber is for fumigating sterilization with insecticide for preservation clothes, plants, old books etc. Our Fumigation Chamber is made of sturdy board, mica covered, Epoxy coated from inside with fume circulator of electric motor. We are offering a product which is checked against various parameters under the vigilance of our quality controllers to deliver a flawless range at the client's end. Moreover, our offered fumigation chambers are available in standard as well as customized specifications as per requirement of our customers. 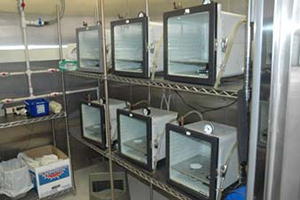 Fumigation Chamber is an ideal for sterilization. Double walled unit has outer made of cold rolled steel sheet duly powder coated.